It’s becoming more common for people to have 5 major career shifts by the time they’re 35 years old. Whether you’re looking for your first career or one that has growth potential and longevity, careers related to the health field are a great choice. 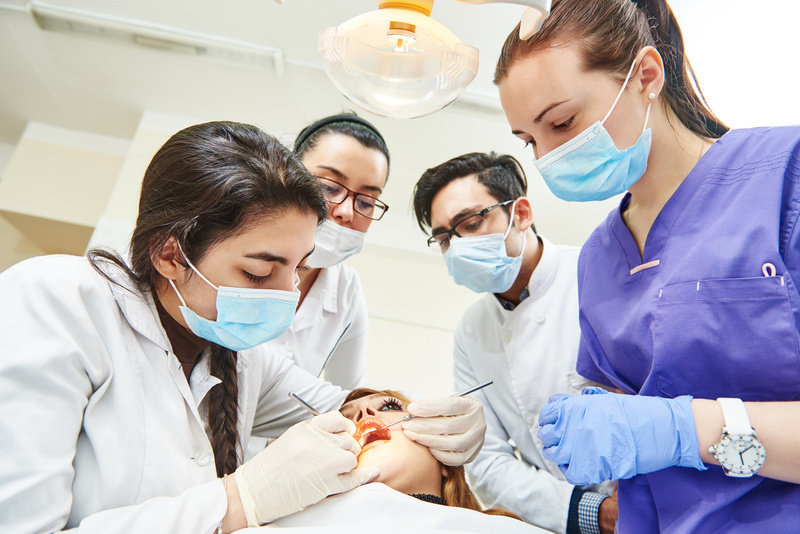 If you like helping people and are curious about dentistry, dental assistant training can prepare you for a career with high-demand and great pay. If you like to help people, advise others on health and wellness, and are good at calming people who don’t like the dentist, this career could be a perfect fit. There are plenty of benefits to becoming a dental assistant that make it a better career than others in the health industry. If you’re considering taking dental assistant training, we’ve put together a guide to help you make the best decision of your career. Whether you’re a working parent or someone who is planning to study part-time, dental assistant positions come in a range full-time and part-time opportunities. While you’re raising your family or studying, you won’t have any lapse in your resume while you live comfortably on a dependable salary. There are lots of ways to get into becoming a dental assistant as well. You could take a course to learn important dentistry concepts and how to work with patients. More likely, you’ll get most of your training on the job. Every dental practice is a little different and every dentist has their quirks. They’re more likely to want you to get to know their style by training side by side rather than coming in with a rigid idea of what the job entails. Otherwise, you can find out what the requirements are for dental assistants in your state. The Dental Assistant’s National Board lists statewide requirements on their website. Knowing what your state requires can make sure you’re adequately prepared while saving you time from over preparation by getting you into a job quickly. Over the last few decades, the job description of a dental assistant has broadened. Where once it was a subordinate position to a dentist, it has now become the first step toward a life-long career in dentistry. Working as a dental assistant is a great on-the-job preparation for a stable, rewarding, and lucrative career practicing any number of dental specialties. Even if you have broader social concerns, like working in public health policy, getting an understanding of how patients are treated builds a strong background. Once you know exactly what works and what doesn’t in the health field, you can conceive of how you can change the industry for the better. Dental assistants don’t have just one role. They move throughout the office, from the waiting room to the exam room. Their role is to find inefficiencies or places where they’re needed and jump in. By working throughout the office in this way, they become an expert on the efficiency of the entire practice. They know where fat can be cut and where your staff needs to be refocused to. Dental assistants have great job security because the flexibility they build over time. If a receptionist falls sick or gets another job, they can fill in for a week while you find someone else. If a dentist is overbooked, they can jump in and prep every patient to make the day zip by. If you’re a community-oriented person or someone who love to help others, dental assistant training can put you in positions to do great things for people. Lots of patients will be uncomfortable going to the dentists. Others may not have been to the dentist in a long time. You’ll even get to work with children who are visiting the dentist for the first time in their life. Your role will be to make everyone feel happy and comfortable with their visit. You’ll be responsible for their comfort and when they leave relieved that it wasn’t as bad as they thought it would be, they’ll thank you. Over time, the dentists at your practice will come to rely on you and see how valuable to their practice. You might get thank you cards and gifts from parents and patients. There are at least 30 million people with a fear of the dentist and each one of them needs someone like you to hold their hand to get over it. Most dental assistant positions are for private general dentistry offices, but there are other offices that perform surgery or orthodontics that offer great roles. No matter where you go, you’ll find a relaxing and professional place to work. You’ll receive respect from patients and peers like few other jobs can offer. In other positions in the healthcare industry, you’ll end up under pressure, overworked, and underpaid. Dental offices offer adequate vacation times, a friendly atmosphere, and respectful treatment of employees. No more dealing with passive-aggressive coworkers or unfriendly CEOs. Dental offices are too tight-knit for that nonsense. Once you start interviewing for positions as a dental assistant, you’ll find that there are some great salary packages available. Everyone has different priorities, whether its vacation, take-home pay, or benefits. Positions in the dental field offer the best of all three. If you’re looking for a stable career to help you get your first home, support a family, or get through school, dental assistant training is a great first step. Check out places like the Knoxville Dental Center to see what options are available for you. With so many directions to take after completing your training, you’ll be pleased with any path you choose. The doors that open will lead to competitive pay, job security, and career fulfillment. If you’re ready for a career in the dental industry, contact us for more tips on where to get started.